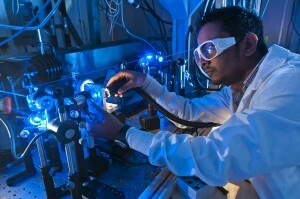 FIU is a prime resource in materials science research, with facilities like the Motorola Nanofabrication Research Center in the Advanced Materials Research Institute and the Center for the Study of Matter at Extreme Conditions. Every year, graduate faculty and researchers conduct advanced studies in metals and ceramics, biomaterials, electronic materials, polymeric materials, alloys, nanomaterials, plasma spray, vibration attenuation, and advanced synthesis and processing techniques. The Master of Science (MS) in Materials Science and Engineering is available in either a thesis or a non-thesis program. Considering our program? You’ll need to meet the university requirements as well as the ones for our program (listed below). You must also have a bachelor’s degree or equivalent from a regionally accredited school. If you’re an international student, you’ll need a degree from a school of higher learning authorized to grant degrees in your country. You’ll be informed of the final admission decision when the Graduate School and the Faculty Committee of the academic department have reviewed your file. In addition to meeting all the admission requirements of FIU and the academic program, international students must obtain a student visa to attend classes in the United States. Apply early! Submit your application and supporting documents by the Priority Consideration deadline dates. The program is available in both a thesis and a non-thesis option. Thesis students complete a minimum of 24 semester credit hours of course work, plus six semester credits of Master’s Thesis Research, as well as a Graduate Seminar. Non-thesis students shall complete a minimum of 27 semester credits of graduate course work, one semester of Graduate Seminar, and a three-credit graduate project. All students are required to pass a comprehensive final examination.